Not So Fast: Egyptian Court Suspends Upcoming Elections : The Two-Way The first round of Egypt's parliamentary elections on April 22 is now in doubt; Egyptian lawmakers failed to send a decree calling for the elections to the Constitutional Court for review. In this Monday, Jan. 28, 2013 file photo, former Egyptian presidential candidate, Hamdeen Sabahi, center left, and former Egyptian foreign minister and Nobel laureate Mohamed ElBaradei, right, speak during a press conference held by Egyptian opposition leaders. The Egyptian Administrative Court has put off planned national elections, the first round of which were to be held in mid-April. In a brief dispatch, Aswat Masriya news of Egypt reports the matter was referred to Egypt's High Constitutional Court. Egyptian president Mohamed Morsi called for four stages of voting to select members of Egypt's lower house, which was shut down by the Egyptian high court last June, after justices ruled about a third of the members were improperly elected. The first round of new voting was scheduled to begin April 22. Now Reuters says that's in doubt: the administrative court ruled the Egyptian upper house of parliament failed to send the new election decree to the Supreme Constitutional Court for appropriate review. 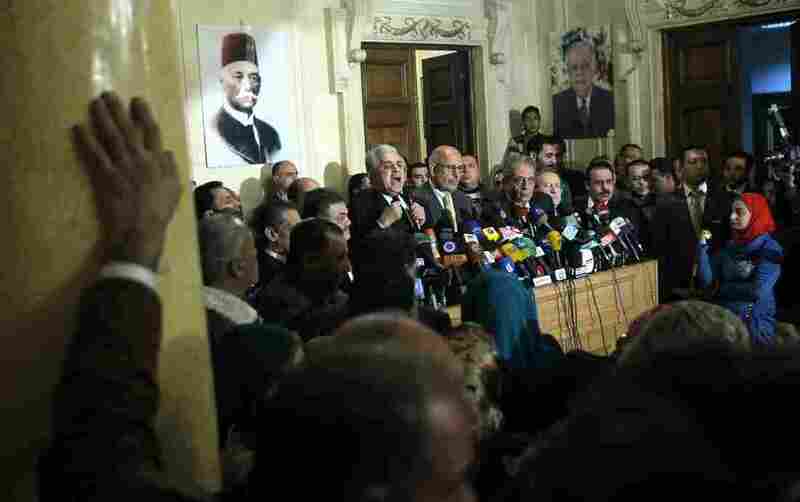 The upcoming vote had already drawn condemnation from some Egyptian opposition leaders, including Mohamed ElBaradei, who tweeted the vote would only encourage "sham democracy", notes the Associated Press. Opposition leaders say Morsi and his political party, the Muslim Brotherhood, are behaving like ousted Egyptian leader, Hosni Mubarek and his allies, such as rushing through a hastily drafted constitution last December they didn't like. They also believe the ruling party has done a poor job of addressing opposition demands and has failed to stem continuing violence, especially in volatile Port Said; CNN reports hundreds were injured there this week in clashes with police.